Toyota is axing the Avensis in 2019 and replacing it with an all-new version of the Camry. The next-gen saloon will use a 2.5-litre petrol hybrid powertrain and be priced in the region of £24,000 when it reaches the UK in the spring. 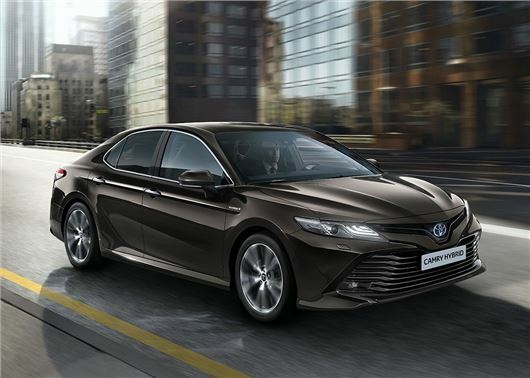 Toyota’s decision to bring its big saloon back to the UK marks the end to a 14-year absence for the Camry, which struggled to compete against the likes of the Ford Mondeo and Volkswagen Passat. The Camry will also mark the beginning of the end for the slow selling, British-built Avensis which will be dropped from Toyota's line-up and have its production slot in Derbyshire taken by the next-gen Auris. Toyota hasn't released much in the way of specs for the new car, but expect the saloon to accommodate four adults in comfort and provide enough boot space to cope with everything a growing family can throw its way. The 2019 Camry will use the same 2.5-litre hybrid powertrain as the Lexus ES and fuel economy that could peak at 60mpg. CO2 emissions should also be low and company car tax friendly; however, unlike the Avensis, the Camry should be entertaining to drive with Toyota promising “fun” qualities like dynamic handling, driver focused dashboard and supple suspension that has been tuned for the UK. The Camry has enjoyed significant success in recent years, with the notable title of being “the world's best-selling saloon” with 700,000 sales in 100 countries. It remains to be seen if the big family-friendly saloon will repeat its success with the SUV obsessed UK buyer. Nice looking car from the outside. Must be a first for modern Toyotas.